Because Wesco is committed to providing the best customer service, all material handling equipment is available through an international network of local distributors, like S.W. Betz. Wesco Manufacturing, located in North Wales, Pennsylvania, has been one of the nation’s leaders in the production of material handling equipment since 1948. Products include drum handling, hand trucks, lift equipment, casters, platform trucks and carts, dock and shipping equipment, and so much more. 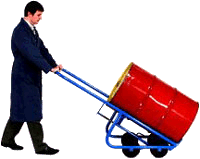 Industrial Steel Hand Trucks: Wesco manufactures a number of durable, dependable hand trucks of different sizes and styles, including those made of industrial strength heavy duty schedule 40 pipe. These hand trucks feature double-welded joints and ribbed cross braces for extra strength. All Wesco steel hand trucks also come with a five year guarantee against weld failure. Deluxe Pallet Trucks: Wesco deluxe pallet trucks feature a five year pump warranty and 5,500 lb. capacity. Wesco Drum Trucks and Pail Trucks: Wesco drum trucks feature heavy duty, double-welded joints, 1″ structural pipe frame, and come with a five year guarantee against weld failure. Platform Trucks: With a heavy duty capacity up to 5 tons, Wesco platform trucks are the most economical way to life and move large bulky loads. All Wesco platform trucks also come with a five year guarantee against weld failure. And this is just the tip of the iceberg of what Wesco has to offer. Click the link below to view Wesco’s extensive product catalog. Founded in 1933, the S. W. Betz Company, Inc. is one of the area’s oldest distributors of quality warehouse equipment. We are an official distributor for some of the best manufacturers in the industry, including Magline, Morse Manufacturing, Presto Lifts, Quantum Storage Solutions, Husky Rack & Wire, Jamco, and, of course, Wesco Manufacturing. S.W. Betz is a family-owned business which continues to offer its customers personalized, reliable solutions to all of their materials handling and storage needs. If you have any questions about Wesco Manufacturing products, please contact S.W. Betz by calling 410-574-1414 or 800-332-0322 today! You can count on the S.W. Betz Company to work with you and provide you with our extensive knowledge of the industry. This entry was posted on Thursday, June 25th, 2015 at 7:57 pm. Both comments and pings are currently closed.